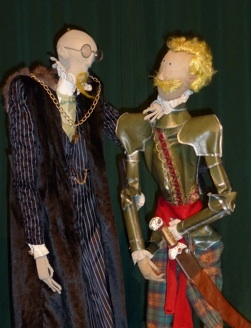 Puppetmongers’ The Miller and His Wife is an absolutely delightful show that will charm children and adults alike. Remounted as part of the brother and sister team’s celebration of their 40th anniversary, the show glows with Puppetmongers’ inimitable combination of wit and childlike humour, simplicity and sophistication. The show, aimed at children eight years and above, is actually an hour-long double bill of Puppetmongers’ first and second plays. The Miller premiered in 1974 and its sequel, The Miller’s Wife, in 1976. During the Q&A session after the performance I attended, David Powell said they had always intended to create a third work about the Miller’s son, but it never materialized. The first part is based on a folktale with variations found around the world. A Rich Man who lives on a hill demands an annual tithe from his tenants. One of these is a Miller who has a Wife and five children. One year he simply can’t afford to pay. Through various lucky chances the simple but sensible Miller defeats every attempt by the Rich Man to ruin him and eventually becomes a Rich man himself. The second part is based on an Irish folktale recast to suit the characters of The Miller. Here an evil Chancellor feels the King has reigned long enough and plots to kill him on his birthday. Learning that the Miller’s Wife is the best baker in the realm, he has her brought to the castle to make a cake that he intends to poison. The demands the Miller’s Wife makes to make the cake, from fetching ingredients to wishing her whole family present, so frustrate the Chancellor’s plans that his increasingly desperate measures to kill the King eventually backfire. Those familiar with Puppetmongers’ later work where the puppets are manipulated on a table, will be surprised to see that their early work takes place on the stage floor itself. As usual they animate the puppets in full view of the audience, speak the narration, do all the puppet voices and even act as scenery. The principal puppets are about two feet tall. Some like the King can walk with the aid of a mechanism in his back. Some like the Miller’s Wife simply stand but have rods to manipulate their arms. Puppetmongers animate the puppets’ heads with their hands. We have become so accustomed to Puppetmongers’ style of puppetry that we may forget that they invented the style that is now known as “American Bunraku Puppetry”. Whereas three puppeteers are needed for each puppet in classical Japanese bunraku, Puppetmongers use only one person per puppet or, as when the Lord Chamberlain’s henchmen carry the Miller’s children off to the castle, one person can make seven puppets move at once. are soft cloth sculptures with intentionally anachronistic clothing. Though both tales are set in the Middle Ages, Puppetmongers have added touches from the 1950s of their own childhood to the figure. The Rich Man wears an amour breastplate and metal helmet above but plus-fours below. The Miller’s eldest son who has his own lines is a separate standing figure. His four siblings in neatly descending height are all attached to the same board so that they amusingly all move as a unit from place to place. The matronly Miller’s Wife is constructed in such a way that as she moves her bosom shakes vigorously to and fro. The King, who is very into physical fitness, wears a specially embroidered royal jogging suit with his crown. The evil Chancellor, like Ernst Blofeld in James Bond, carries a white cat he likes to stroke. Perhaps the cleverest invention is the Miller’s cow Rebecca. In the course of the action, the Rich Man kills her and the Miller skins her to hake her hide to market. 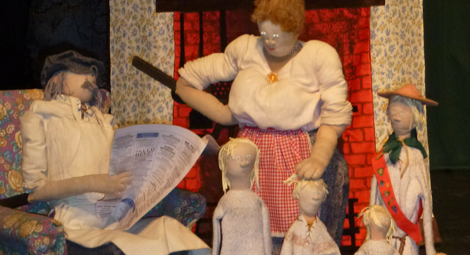 This may sound gruesome but Puppetmongers have made it delightful. All the Miller has to do to skin her is pull off her detachable udder, find the zipper and unzip her skin. Inside are two cloth cubes of “meat” that the Miller’s Wife happily takes home. Between them Ann and David Powell do nineteen different voices for the show, Ann voicing the good people while David specializes in the bad. Ann’s slow-speaking but straight-to-the-point Miller is quite amusing as are all of David’s hapless villains. If you want a warm respite from the high tech world, an hour spent with The Miller and His Wife will remind you of the old days when imagination was cherished and could make a pillow or a stick move about, talk and have adventures. Both children and adults today have a need to experience the joys of this type of storytelling. Luckily, Puppetmongers are still here to provide it. Photos: (from top) The Miller, his Wife and four of their children; the Chancellor and the Sergeant-Major. ©1974/76 Ann Powell.